Spread a variety of toppings, condiments, and sandwich spreads with this 11 1/2" polypropylene sandwich spreader with WebstaurantStore logo. A great investment to replace more expensive metal or wooden spreading tools, this flexible, 11 1/2" sandwich spreader allows you to accurately apply butter, jelly, mustard, mayonnaise, and much more with ease! Stamped with the WebstaurantStore logo on the side, this spreader is the perfect addition to your kitchen. An extremely versatile and handy kitchen tool, this spreader can do more than apply toppings - it can also be used to remove muffins and cupcakes from non-stick pans, trim frosting on cakes, or mix icing colors together. As any chef knows, these implements end up getting used for all sorts of things in the kitchen, and a lot of brands tend to have short lives under hard use. These have held up very well so far. You cannot beat the price. This is an extra long sandwich spreader, and it works great for getting into large containers or getting the last bits out of a normal container. The nylon material cleans up nicely, and is very durable. I’m serving European style waffles in my shop. Taking Nutella from its jar and spreading on waffle sometimes can be difficult. But if you have this spreader it’s very easy! When a shorter spreader doesn't get the job done this is your life saver. This long handle spreader makes easy work of large gallon mayo tub. You really get to the bottom of it and it's great for those longer subs. I really love this spreader. It is durable, has a long handle to reach into mayonnaise or any other large jars. It spreads butter, jams, sauces, frosting. I also use it to scrape out bowls, to slice sandwiches. It firm, yet flexible to get the last bit from the bottom of the jar. Excellent product! A nice long handled spreader that is wonderful for mixing our bagel spreads and smearing them on the bagels. Great for our brunch events away from the bakery. This 11-1/2" nylon spreader is great for a variety of foods.its strong quality plastic material and perfect for spread butter I am satisfied with this product. These spreaders work great to spread thin items such as peanut butter or Nutella, We use these spreaders daily and over time they will ware out, yet are still effective to spread a thin ingredient. This Nylon Sandwich Spreader is great. I love that is light weight and it spreads the butter perfectly. I love the material and the color. Sized 11.5 inches long, this sandwich spreader is also a great width ( less than 1.25 inches) to enter condiment jars. This spreader has the Webstaurant logo on it, and it is made of nylon. I really like this spreader. The extra long handle makes it super maneuverable, and fits well int he hand. The price is excellent, the branding is tasteful, and it works great. I absolutely love this sandwhich spreader because of its long handle making it easier to reach all ends of a cake or cupcakes when icing them ! Easy to use, durable and sturdy ! This sandwich spreader is perfect for spreading condiments on sandwiches or butter on toast. The quality is pretty good, especially for the low price. It is much easier than using a butter knife for spreading. After using a sandwich spreader you will never go back to using a knife for sandwiches ever again. This product is perfect for peanut butters, mayo, or any other kinds of spreads! This is an awesome nylon sandwich spreader. It is 11 1/2" in length and has websterauntstore logo printed on it. This is a thick plastic and spreads nice and easy. These nylon spreaders are very inexpensive and easy to use. They are perfect for sandwich condiments, such as mayo or mustard, and excellent for butter or jam. This nylon sandwich spreader has the webstaurantstore logo on it, which means you get a better price on it. If you are looking to save some money on a sandwich spreader you can buy this item instead of buying a wooden or metal option. This spreader is lightweight, durable, and easy to clean. The edges are sharp enough to be precise, and very smooth. The logo will wear off with use and sanitizing. The 11 1/2" Nylon Sandwich Spreader is an excellent quality spreader. It is great for reaching the bottom of tall jars and it spreads condiments with ease. It can be placed in a dishwasher. Glad I purchased this. Long handle is perfect for getting the last bit of condiments and spreads out of tall jars. Easy to clean, too. Webstaurant's spreader. Very functional! Size is 11 1/2 nylon. Surprisingly , we like webstaurant 's products. They do the job. We recommend and give 4 stars. This is an awesome spreader. Been looking everywhere for one with a decent height to dig deep into bottles. This does the job perfectly and is super cheap. I use this eleven and a half inch Nylon Sandwich Spreader with Webstaurant Store Logo on a regular basis, especially with dense condiments like cold butter. We recently started expanding our sandwich recipes and this tool has been invaluable with any big sandwich. And I always appreciate the positive sincere feedback from. Works well, great solid construction, not too heavy and easy to order. This spreader is awesome; its length allows me to dig deep into the corners of spreads and jams, and you cannot beat it for its price. I like this 11 1/2" Nylon Sandwich Spreader. The long handle really makes it easier to spread things on larger pieces of bread. I would recommend. I use sandwich spreaders for really anything, from jelly, jams, peanut butter, margarine, even paint or caulks, lol. these are a great price, I need to get more! This nylon sandwich spreader can be used for many different jobs. I use mine to loosen the sides of my cakes from the pan after they have cooled. It won't scratch up your cake pans like a metal off set spatula might. The longer handle on the 11 1/2" Nylon Sandwich Spreader make this tool ideal for condiments in taller jars. It also works well as a scraper for the blender. This is an awesome tool for your deli or home kitchen. It spreads very easily, and is just the right size for small or large slices of bread! So glad that I found these nylon spreaders - and they're a bargain. This is my favorite size, because it has a long reach, making it perfect for spreading mayo, or softened butter on dough. I also use the spreaders to loosen fresh cake from the sides of the pan after baking. I have this size and the smaller one of this nylon spreader and they're both great. this longer version is perfect for restaurant sized containers of condiments without getting product all over your hands. This sandwich spreader is a bit too large for me, but it's still a good buy if you need one in this size. It works very well. I have no problem displaying the logo of a fine company like Webstaurant. The spreader is nice and durable and gets the job done well. I love the length of this plastic spreading knife very handy with deep condiment jars and great for spreading condiments on long loaves of hoagies . Another very handle product that's sturdy and just long enough. I use this mainly for butter and it works just fine for that. I love having a product that is made just for the task at hand. We have been searching high and low for a scraper to get to the bottom of our blendert, and this is finally what we use! Everything that is long enough is usually silicone and gets cut. these being a hard plastic is super helpful and they stand up to scraping past the blades. Love these, will order many many more! They could be a little stronger, but thats only small nit picking. This is a very handy tool at a very inexpensive price. I like to use the long handled spreader like a spatula to get the last bit out a deep jar. They clean easily, too...I can't think of a reason not to buy this! What a nice tool. 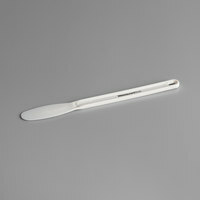 The 11 1/2" Nylon Sandwich Spreader with Webstaurant Store Logo is very cheap, but still a very useful tool. The long length allows you to get into tall jars without getting jam, etc on your fingers. I love these longer spreaders. I use them primarily to get thick cookie dough out of the mixer bowl, and they certainly stand up to the task! I love how sturdy they are, and inexpensive! I REALLY LIKE THIS SANDWICH SPREAD, IT IS VERY CHEAP AND DURABLE. I USE IT FOR SPREAD MAYONNAISE AND MUSTARD. IF YOU HAVE THE OPPORTUNITY BUY IT. We love these little spreaders for putting butter and sauces on our sandwiches. The long handles make it easy to reach the bottom of big mayo jugs. We have several of these and they work great for bagels and sandwiches. They don't tear the bread like ordinary kitchen knives tend to do. Durable and I love the price! They work great for scraping down the sides of the food processor (with the blade still in), reaching into the bottom of jars and cutting around the edge of a cake in a non-stick pan without worrying about marking the finish. They won't last forever because the tip is so thin and flexible, but that is what makes them so useful. Spend the $, you'll be glad you did. Love the length and easy to use. We use nutella all the times but this is a very nice tool to use for. No messy hands. These are awesome spreaders for the amount of money they cost, we use these all over, when they get on the older side we just buy new ones because they are so cheap, great product!!! We are happy with this sandwich spreader. It is easy to clean. It is sturdy. The logo has long worn off, due to constant use, but they still hold up well! I use these spreader for everything from frosting cupcakes, leveling off ingredients, scraping bowls and making my kids sandwiches for school. I have 4 or 5 of these because I find myself always needing a clean one, so its good to have a few in case one or two is dirty. you can't beat the price of this spreader. It's long handle allows you to spread a cake in no time flat. My employees really like them too. I bought this spreader to replace my existing butter spreader.i always have problem with reaching the bottom of the bottle when the jam is almost over in long bottles. The long handle makes it easy to reach and scrape the remains. This is not a great product the area to spread with is kinda small. I wouldn't recommend this product as the coverage spreading area is way to small.